As we look back at this year’s World Cup, the world’s beautiful game certainly threw up its fair share of drama. And as with each and every World Cup, the players were the maestros of the spectacle, stars on the stage entertaining millions around the world. Through infamy and glory, the players become legends on the pitch – rock stars in the eyes of many and household names in a flick of genius. But what if they were indeed music legends instead of sportsmen? What music would they make? What genre of music would best represent them? What would their album covers look like? New York-based British designer James Campbell Taylor decided that he would bring to life that imagination. 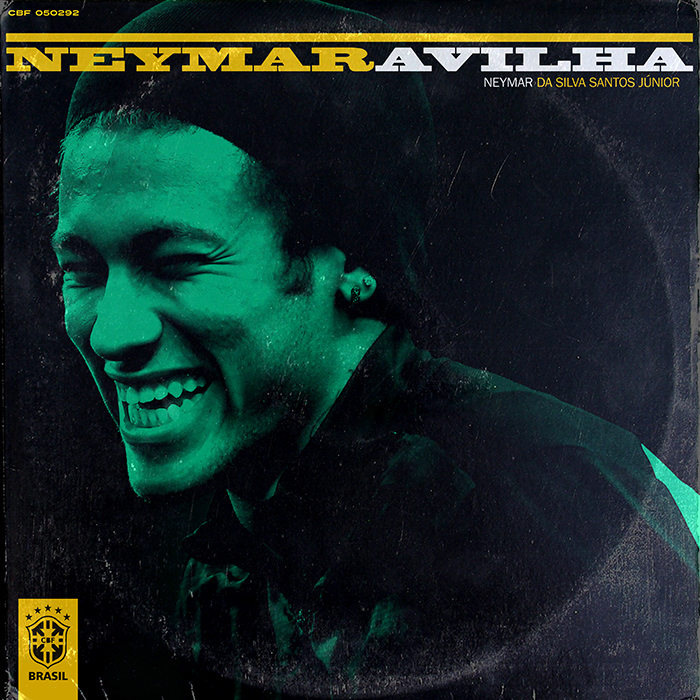 The designer, who lives in Manhattan with his wife, spends a lot of time thinking about football and music, so it was a very obvious choice to combine the two interests through design – interpreted retro vinyl covers with the players of yesteryears as the music artists which he calls, LPFC. 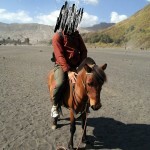 “I’m surprised I didn’t think of it sooner… Honestly, the idea just came to me one Friday evening as I was walking home. I ate dinner and immediately got started,” said Taylor in an email interview from New York City. Taylor remembered some players’ attempt at making music, most usually terrible, and decided to take an abstract approach to his interpretation. 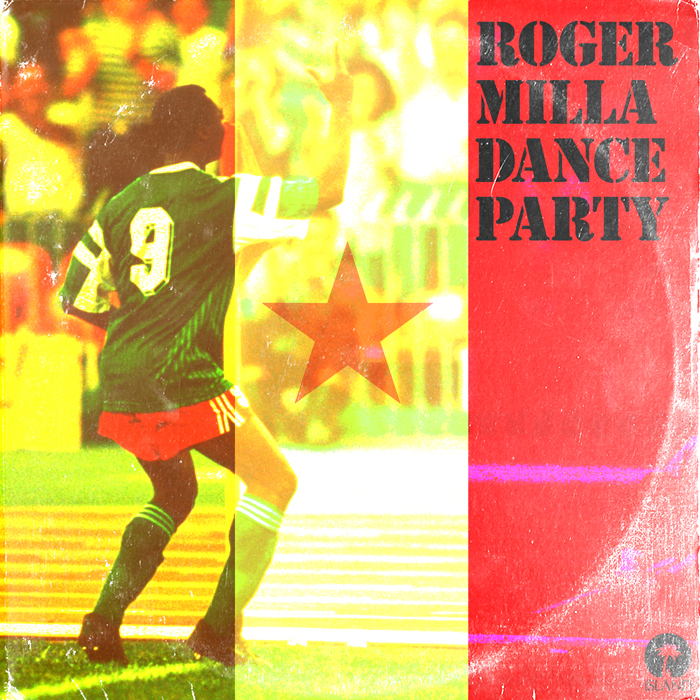 The result is a spectacular treat for football fans, and for crate diggers and vinyl collectors. 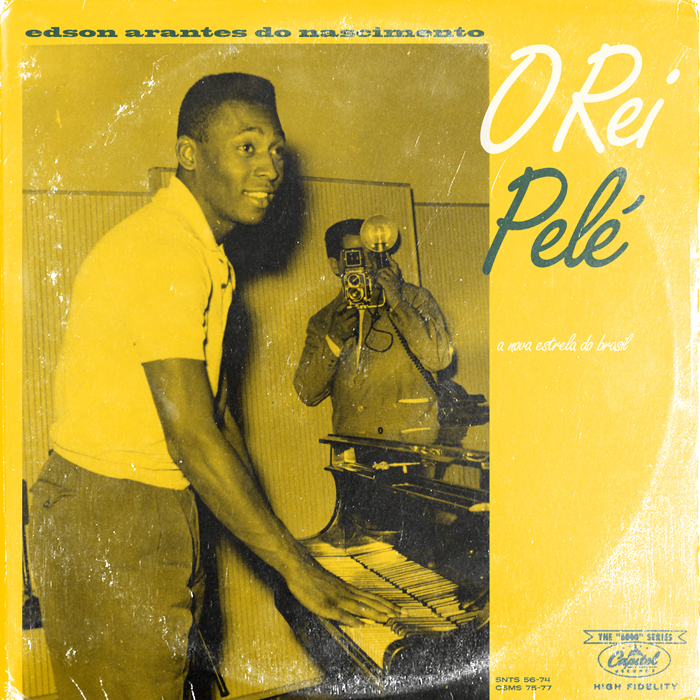 Fans of Henry Mancini, Eumir Deodato, Jorge Ben, Gato Barbieri, 60s British mod movements, Blue Note or CTI records and other music classics will find many reference points. The affable football fan who predicted an Argentina win and who will surely be nursing a hangover after their 1-0 loss to Germany in extra time, took some time out of his schedule to talk a little bit about his designs and of course, football. What’s your own music collection like? LPs, CDs, what do you posses? When I turned 30 my wife bought me a record player, a gift that changed my life. Here in New York there are several great used vinyl stores and I’ve been able to build an extensive collection of LPs. I think I have over 400 now. It’s truly the best way to listen to music. I never download albums because I enjoy the design of the packaging almost much as the records themselves. I want the complete product, I want to pick it up, read it and look at the artwork. So for this reason I still buy new music on CD, though sadly even in New York it’s hard to find a shop that sells them. There seems to be a heavy 60s and 70s jazz, Afro Cuban, Henri Mancini movie soundtrack and bossa nova influence in your choice of covers. Are they the genres of music you’ve grown up with? Not really. 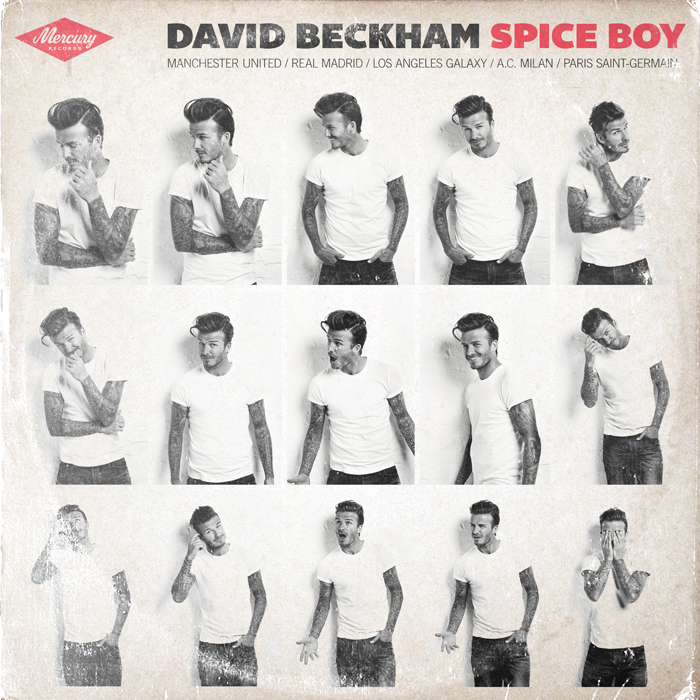 As a boy, I grew up listening to more classic pop and rock. But I was always very aware of my parents’ records and spent hours looking at the covers, many of which I can still visualise now. Later, I started listening to jazz as a teenager. You have a very strong attachment to history from your posters and now your LP art. Why a penchant for the retro? Well, I think it’s important to have a good sense of history — that’s true for designers as much as everyone else. I take pleasure in placing examples of graphic design in their historical context, and seeing how graphic styles vary between genres and eras. It’s incredible to me that a choice of typeface or subtle stylistic flourish can suggest a very specific time and place. We all respond to these graphic details whether we know it or not. 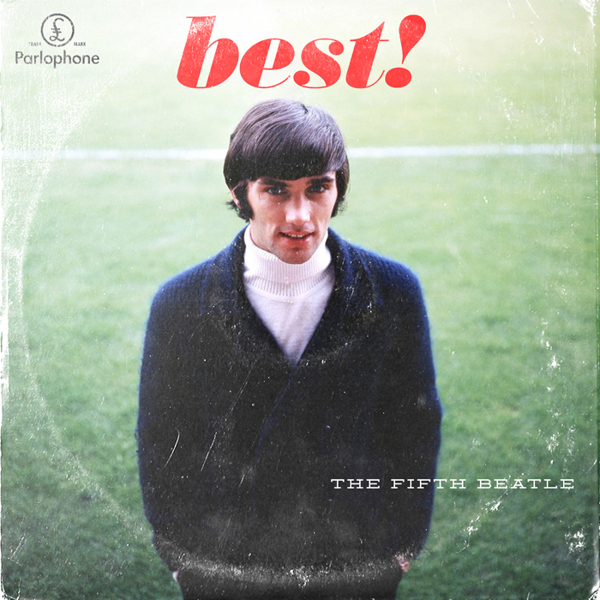 So for the LPFC project I tried to evoke the period for each player’s album, assuming the record was being released around the time of their success on the pitch. I also considered where each player was from, and what the popular graphic trends at that time were in that particular country. In this sense, the challenges were similar to those faced with my World Cup poster project. Who’s your favourite football star of past and why? And favourite team? I’m 35, so my favourite players are those I grew up watching: Lineker, Van Basten, Batistuta, Maldini. 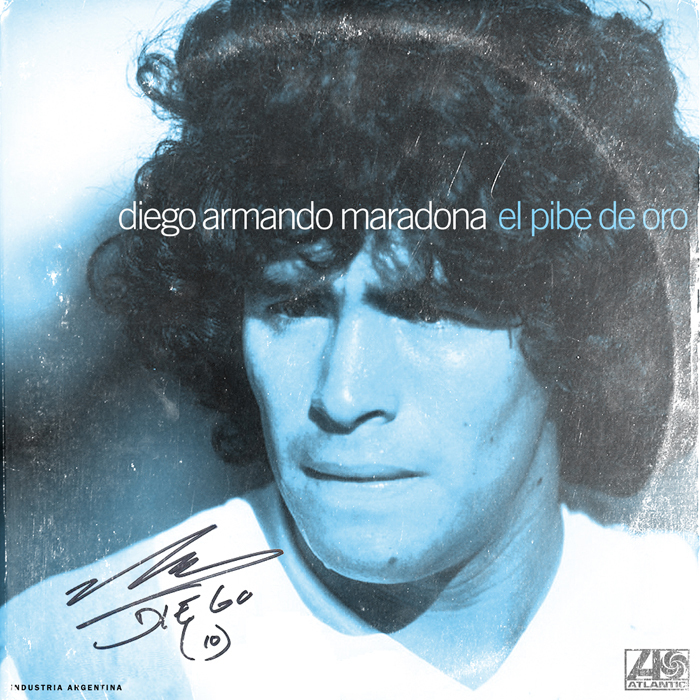 Of course, Maradona was the greatest of them all. I support two teams, my local club Leicester City (now back in the Premier League) and Fiorentina, because I used to live in Florence. Who were you rooting for this World Cup? Unfortunately I was rooting for England, who still managed to disappoint despite my very low expectations. My other favourite team is always Italy, who didn’t do much better. Once they were both out I started supporting Argentina, although I enjoyed watching other South American teams, especially Colombia and Chile. I didn’t like this year’s Brazil side — I thought they were lucky to get to the semi-final, though of course I never expected them to capitulate so disastrously. 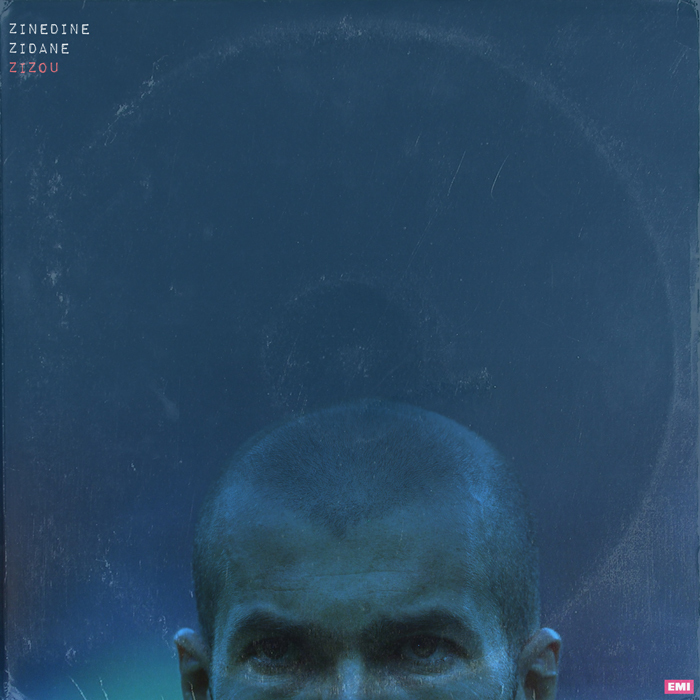 Talk us through the Zinedine Zidane cover. What was the music inspiration? The designs of each LP suggest a certain musical style, and this extends to the choice of record company label, some of which are known for certain types of music more than others. But since we can’t hear the records, the “music” is left to our imagination. This left me little option but to attempt to have the album covers reflect the players’ personalities. In this way I was reminded of the famous Blue Note designer, Reid Miles, who didn’t even like jazz and relied on the studio engineer’s descriptions of the music for inspiration. 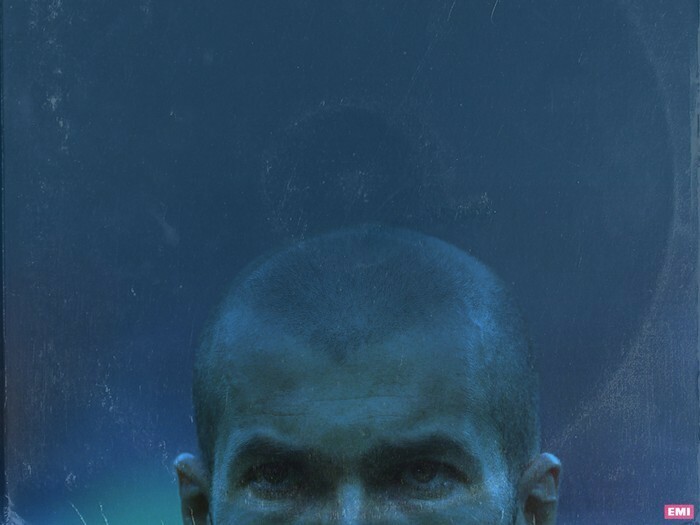 Zidane always struck me as a cold player. He seemed aloof, not particularly happy or friendly, even when he was winning. His bald head was instantly recognisable, and he’d used it to memorable effect in two World Cup finals: scoring twice in ’98 and head-butting Materazzi in ’06. Musically I imagined it to be cool and electronic, very European. One of my main concerns with this project was to avoid clichés, so as not to represent a player or graphic style in a tired or obvious way. I kept the designs quite minimal, without making excessive reference to victory or success. 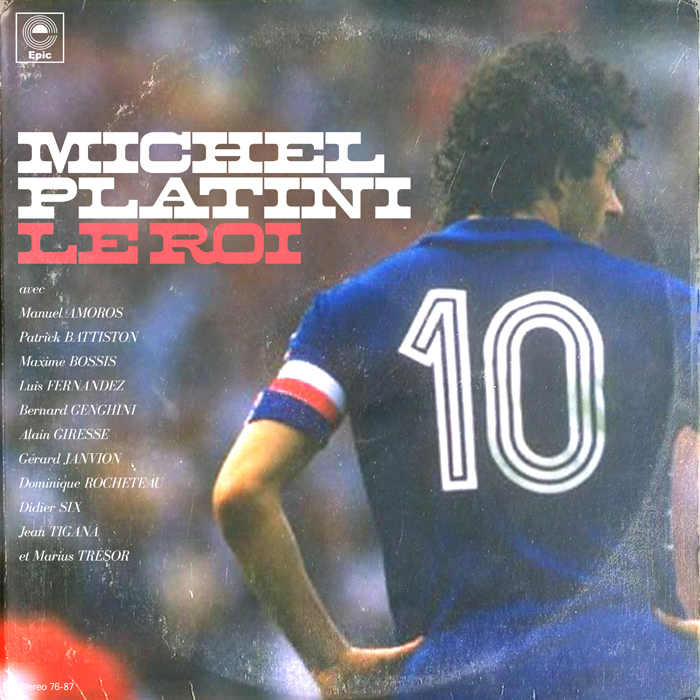 So much graphic design (in football and music) is too loud, when in reality many LPs from that period say very little, at least on the cover. 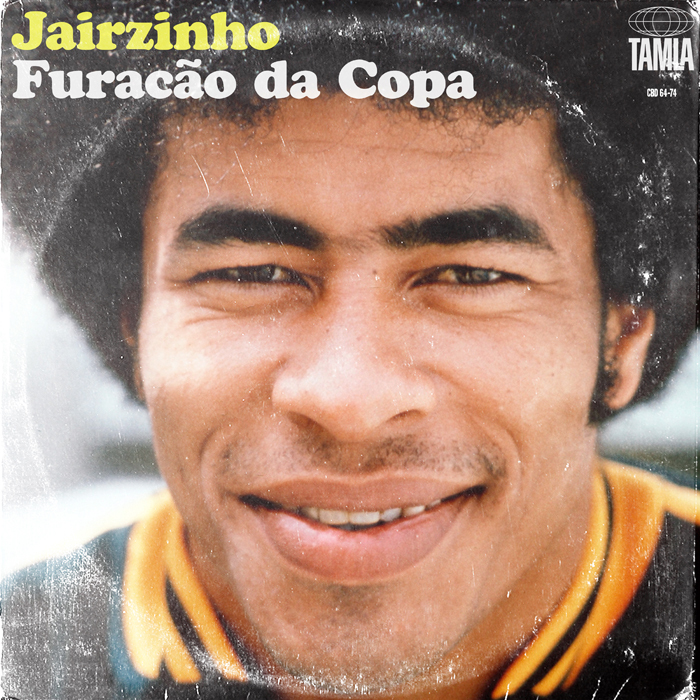 In several cases (Pele, Charlton, Maradona) I chose images of players when they were very young, when they were just talents on the verge of superstardom. These early images have extra power because we now know everything that happened to them later in their careers, so the designs have greater resonance. What kind of contemporary music stars would current players make? 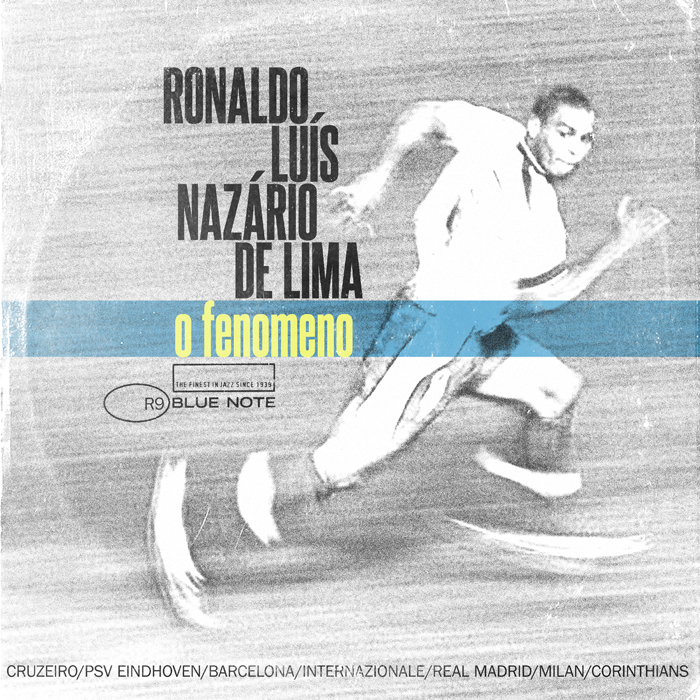 I was actually asked to create LP covers for some current players by Mundial, a World Cup-themed magazine (pennarellodesign.com/portfolio/mundial). Though I took the same approach as before it was a challenge to come up with the concepts: it seems very few of today’s footballers have enough personality. I didn’t include Messi so I’d like to see him make a Carlos Gardel-style tango record. Pop music doesn’t have the same impact on the public it had thirty or even twenty years ago. Football has replaced it as the global pop culture. 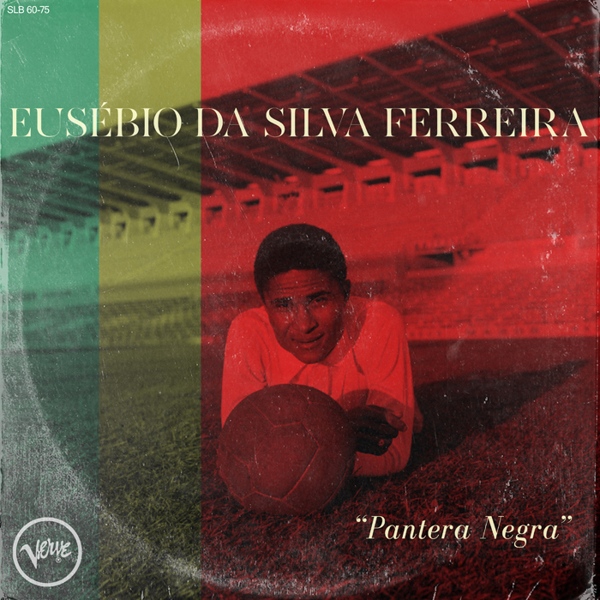 But with this project I hoped to suggest the notion that there is no such thing as a “football icon” or “music icon”; rather an icon is such precisely because they are able to transcend their chosen field. What football stars would make your ideal rock band? 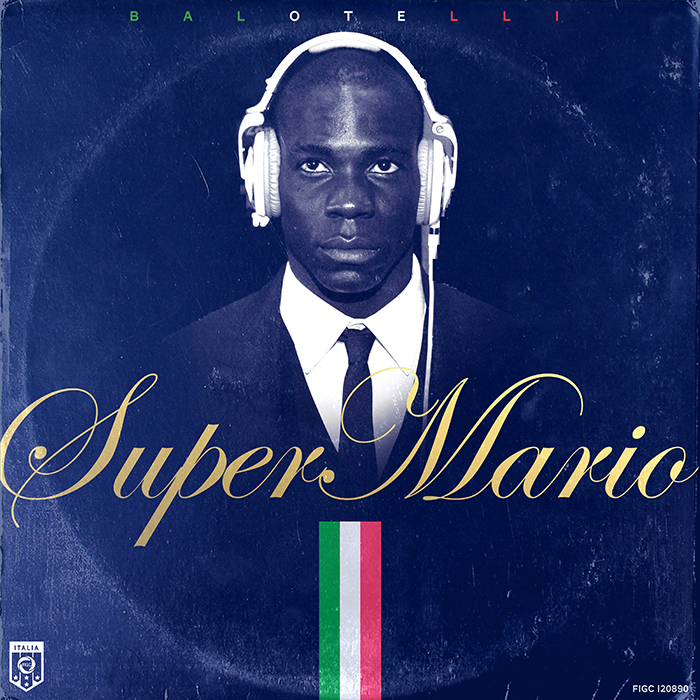 Angel Di Maria on guitar, Mats Hummels on bass, Arjen Robben on piano, Juan Cuadrado on percussion, David Luiz on saxophone, Guillermo Ochoa on drums (I always say goalkeepers are like drummers) and obviously Mario Balotelli on lead vocals. What can we look forward from you in the near future? Last month I went home to England and pulled some work out of the “archive”, which I’m slowly getting around to putting on my website. 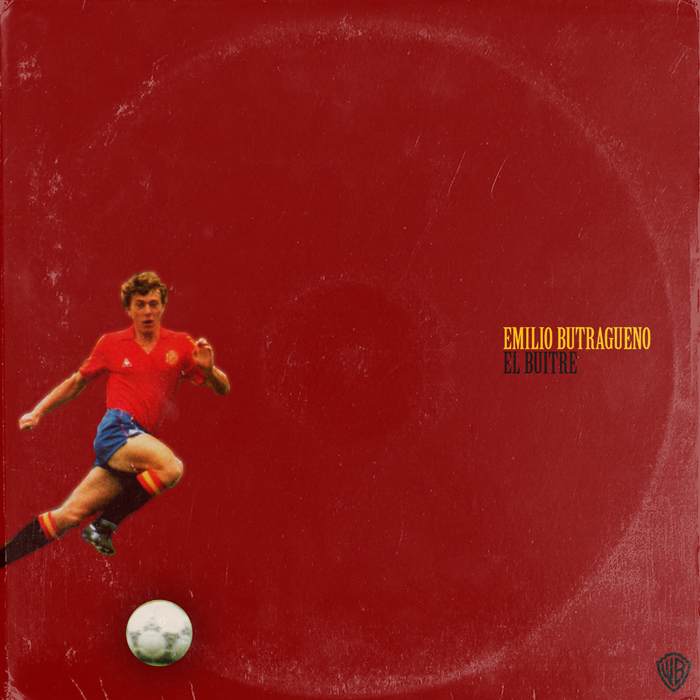 I’ve recently completed a project celebrating famous World Cup goals, and I’ve also started a new website about my football shirt collection, called Shirt Tales, which I plan to update this summer. My other upcoming projects are more photography-based: I’m about to start a digital photo project involving different species of flowers. After all the football this summer I had to try something different! View the rest of James Campbell Taylor’s LPFC projects at his online portfolio. Cool stuff all around.